BONN, Nov 19 2017 (IPS) - As the summit of governments known as COP23 reached its conclusion in Bonn, Germany this week, two clear alliances have emerged in the global energy landscape. One of them, the International Solar Alliance, was launched in Paris and is all set to become a legal entity. The other, an alliance to phase out coal, was announced on Dec. 16 in one of the biggest developments at COP23. Jointly launched by Britain and Canada – both developed countries – the alliance already has 20 members, including Italy, France, Mexico, Norway, El Salvador and several U.S. states. The International Solar Alliance, on the other hand, is led by India – an emerging economy. Forty-four countries have already joined this alliance, of which 16 have also ratified it. As a result, the alliance will come into force on Dec. 6. The launch of the Global Alliance to Power Past Coal comes at a time when global carbon emissions are rising. Earlier in the week, the University of East Anglia and Global Carbon Project global emissions report showed a significant rise in global carbon emissions in 2017. The rise was observed after three years during which emissions figures were static. The biggest increase in carbon emissions occurred in China and India. According to the report, Global CO2 emissions from all human activities are set to reach 41 billion tons (41 Gt CO2) by the end of 2017. Meanwhile emissions from fossil fuels are set to reach 37 Gt CO2 – a record high. China’s emissions are projected to grow by 3.5 percent while India’s emissions are projected to grow by 2 percent. The members of the new alliance, which aims to grow to 50 by the next COP in 2018, would not only phase out coal in their own countries by 2030 but also stop investing in coal-fired electricity both within and outside of their countries. In sharp contrast, the members of the other alliance – the ISA – are reluctant to make any commitment to end coal energy before 2030. India, the leader of the alliance and a major coal producer, argues that coal is needed to end poverty and provide its poor citizens access to electricity. The country plans to produce 1.5 billion tons of coal by 2020 – double the amount it produces now. “From the Indian perspective, let me make it very clear: there are development imperatives which as a country we need to fulfill. If you look at the total emissions, our contribution is miniscule. The point is, while this factor is spoken of, what is not spoken [about] is India’s extreme effort at trying to get energy much better,” said India’s Environment Secretary in a definite statement to the press. Anand Kumar, secretary at India’s Ministry of New and Renewable Energy, said that IAS’s core goal is to bring 121 countries on a single platform to explore ways to utilize and promote solar energy. Besides production, the alliance would also focus on making solar energy cheaper and more accessible by garnering investment, bringing down the cost of solar cells, solar modules and solar storage. The other prominent members of the alliance – China, Australia and New Zealand – still heavily invest in coal, even as they’re trying to produce more energy from renewable sources. At the COP, soon after the emissions report was presented by the University of East Anglia, Brazil, India, South Africa and China – known as the BASIC countries – released a joint statement reiterating their right to grow and asking the world to look at their emissions from the perspective of equity. However, even as the new Global Alliance to Power Past Coal was announced, some of the statements raised doubts over whether the alliance only wanted to end unabated coal or coal in general. Unabated coal refers to plants that are not fitted with carbon capture and storage (CCS) technology, which captures the harmful emissions that cause global warming. Perry did not elaborate if the UK or the new alliance would still support use of abated or partially abated coal. Interestingly, Germany – which provided the venue for COP 23 – has not announced its intention to join either of these alliances. This has been severely criticized by anti-coal activists who have accused Germany of having a double standard by organizing the climate conference while not taking a strong step on either ending coal or shifting to renewable energy. On Nov. 15, as Angela Merkel reached the COP to address the parties, the activists laid out a red banner that read “keep it in the ground” for the chancellor to walk on. “We want no coal. 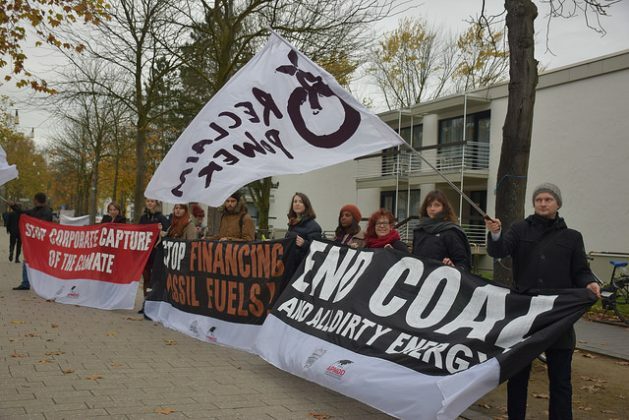 We want no dirty power,” said one of the activists who was not allowed inside the conference.